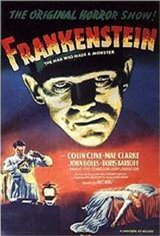 "Frankenstein" is a film about a mad, obsessed scientist, Dr. Henry Frankenstein", who creates a monster, by taking body parts from dead people. Upon placing a brain inside the head of the monster, Henry and his assistant Fritz are amazed that the experiment is alive. When the monster mistakenly kills Maria, a young girl he meets down by the river, the town is up in arms and aims to bring the monster to justice. They find the monster and his creator in an old windmill, where the monster is attempting to kill his maker.